BEFORE: Another day, another advanced screening. For today, we have the upcoming animated film Rise of the Guardians. This is actually only the second animated film of the marathon, the first since The Iron Giant on the second day way back in July. (I am working on a substantial animation chain but that probably won’t take place until early next year). The film features a few familiar faces, or voices rather, including Alec Baldwin (last seen in Glengarry Glen Ross) and Hugh Jackman and Dakota Goyo (both from Real Steel). Going into the film I’m not that excited based on the trailer but I have been wrong before. AFTER: Sometimes it’s very easy to put my thoughts about a film into words and other times it is extremely difficult. One of the reasons it is difficult sometimes is because I have varying opinions and feel pressured to pick one and run with it. With Rise of the Guardians, my prevailing thoughts throughout the entire film were, “It’s a very fun and engaging film, but it’s not a Pixar-caliber, Toy Story-level film”. That is until the end when I started thinking about the film in isolation without comparing it to Pixar or other animated films. Now let me be perfectly clear: comparisons between films are very useful. They allow you to see patterns of what works and what doesn’t visually, thematically, and storytelling as a whole. But other times, categorizing films based on similar attributes can remove key elements to a film and focus the attention on a handful of good or bad parts. Rise of the Guardians is a kids film. The whole story is based on childhood beliefs of Santa Claus, the Tooth Fairy, the Easter Bunny and all the others. At times, the film relies on childish tricks like physical pain to get laughs from the audience. But this doesn’t mean the film can’t be good. There are so many great characters, main and supporting, in this film. And let’s face it, no matter how old you are, you’ll always remember the time when you used to believe in these magical people who brought you presents on special occasions. Rise of the Guardians doesn’t just show these characters, it explores them. You find the “centers” of the characters, what it is that makes them tick, and you can connect with them on a human-level instead of as fictional creations. And it’s done in a very amusing and entertaining way. Quite often the whole theater would break out into laughter because of a joke, or a gag, or a specific character (the Yeti comes to mind as a crowd, and personal, favorite). One of my favorite scenes in the entire film was when all the Guardians are going around collecting teeth after they are dealt a big setback. This scene really highlights all the characters and the friendly competition they have between them. I mentioned in the beginning how I felt the entertainment value was diminished because I was too busy comparing Rise of the Guardians to other films. Not all the characters were perfect, Santa Claus (Alec Baldwin) was probably my least favorite character (a sword-wielding, tattooed, Russian Santa; really?) and while the other characters were very good, there was something missing from the ensemble that’s present in a film like Toy Story or even another Dreamworks film Shrek. I also felt the same way about the story: fun and lively with a deeper meaning to connect with but with something missing. The reason I give other films 5-stars, is because the film is an experience. The film creates a place where I can escape to and get lost in for about two hours. I’m left with a feeling so powerful, that I overlook slight flaws because overall, it’s storytelling at its finest. 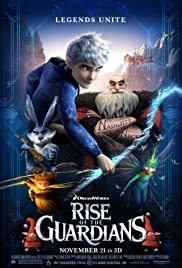 As someone who loves to overanalyze things, I felt Rise of the Guardians was lacking in some areas but was an overall great film. But looking at it as a kid who’s not really thinking about the creative and technical processes that go into filmmaking, Rise of the Guardians is a fantastic film. It is an experience, a place to escape for an hour and a half. It is storytelling at its finest. Rise of the Guardians opens in theaters on November 21. UPDATE: I forgot to mention this when I first published the review, but the screening was in 3D. A big question for moviegoers nowadays is whether or not it is worth the surcharge to see a film in 3D. For Rise of the Guardians, don’t bother. Overall, the 3D is done very poorly and doesn’t add anything to the story or the film experience. Most of the film doesn’t have any 3D at all (no depth or pop-out effects) and when there is, the 3D experience is more often the bad pop-out effect rather than the good illusion of depth effect (although there are a handful of well done scenes like that).